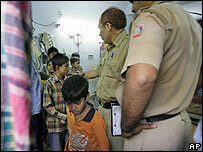 About 70 child workers in India have been discovered working in a Delhi textile factory, officials say. They say that the boys were embroidering saris and wedding clothes in a sweatshop when police and activists swooped to rescue them. Officials say it is the third such raid made this week, following a report on Sunday in a British newspaper on child labour in Delhi. The boys are reported to be between eight and 14 years old. Activists say they were mostly the children of poor farmers from the poverty-stricken eastern state of Bihar. Police say they are noting the addresses of all children working in the factory so that they can be re-united with their families. They say that the work they were doing entailed using extremely fine needles and glittering synthetic fibres to make saris. On Sunday a boy was reported to be on film making clothes for Gap shops in the west. Gap, which has made commitments not to use child labour, said that only one item - a girl's smock blouse - was involved. They say that child labour is "completely unacceptable" and that a "strict prohibition" was in place. The alleged incident was part of an investigation by the UK's Observer newspaper which quoted him as saying that he had been sold to a factory owner by his family and had worked for four months without pay. India's trade minister and bodies representing garment manufacturers have dismissed allegations that child labour is widespread as a crude attempt to blight the country's image. The textile and garment industry employs about 44 million people. But campaigners say that child labour is commonplace, and far higher than government figures which estimate that about 12.6 million Indian children work as domestic helpers, or in roadside restaurants and factories. The campaigners say that the true number could be as high as 60 million, with one estimate saying that 20% of India's economy is dependent on children under 14-years-old.